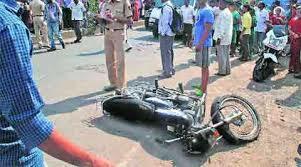 PUNE: Riding a two-wheeler on the roads in Pune city and Pimpri-Chinchwad continues to remain an unending nightmare for residents, with a staggering 132 riders losing their lives in a span of just seven months this year and over 250 suffering serious injuries. The dead include as many as 75 young riders, those below 40, a frightening scenario for families which lose key member. What is equally shocking is none of the 132 riders or pillion riders were found wearing a helmet, say police, who are now laying emphasis on reining in the tendency to ‘overspeed’ among riders by launching an enforcement drive. According to figures available with the Pune traffic police department, up to July end, 96 bikers, 17 scooterists and 19 moped riders were killed in accidents on roads within the jurisdiction of the Pune Municipal Corporation (PMC) and the Pimpri-Chinchwad Municipal Corpora-tion between January and July. And as many as 260 are those who suffered serious injuries to their heads and limbs, some of whom could still be laid up on hospital beds. Another 130 are those who have suffered minor injuries. In the corresponding period in 2016, 114 two-wheeler riders were killed and 226 were seriously injured, meaning this year there were more fatalities and serious injuries. The figures reveal that up to the age of 40 and less, at least 75 young riders lost their lives. Sixteen riders who lost their lives are between the ages of 45 and 60. There are at least 31 riders whose age the police could not confirm. Some of them, police say, are young riders. Over the years, the Pune traffic police always called upon the youngsters to exercise self-restraint while riding but their pleas have consistently fallen on deaf ears, say civic activists. However, the traffic police this time seem to have decided to take up the issue in all seriousness and purpose. “We will launch a drive to rein in overspeeding tendency among two-wheeler riders, especially youngsters. We are sure this will help in saving lives…,” said DCP Morale. The drive, he said, will be launched after Ganesh festival. The enforcement, Morale said, will include a check on overspeeding as well as ensuring that riders wore helmets. “Our drive against mandatory wearing of helmets is under way and will be stepped up after the festival,” he added. Civic activists, however, argue that overspeeding was only one of the causes for two-wheeler riders constantly losing their lives on Pune’s roads. “Overspeeding by bikers is one of the main causes, but we also need to look closely at other factors responsible for the accidents. The civic bodies like PMC and PCMC are equally responsible for the avoidable deaths of the two-wheeler riders,” said Prashant Inamdar, convener of Pedestrians First. Inamdar said that after every accident, a proper investigation needed to be conducted to find out the elements responsible. “For instance, we need to check whether road dividers are properly painted in white so that they are visible for rides at night, whether speed-breakers are according to norms or of abnormal size, whether the roads are properly illuminated, whether the roads are potholed or had craters…We need to examine each and every aspect of the state of roads before coming to a conclusion,” he said. Once a proper investigation is done, Inamdar said, the report should be sent to the civic bodies like PMC or PCMC and cantonment boards for their corrective actions and taking negligent officials to task. “It is the responsibility of the civic bodies and cantonment boards to ensure that the road conditions are safe for the users. And they should punish officials who are found wanting in their duty,” Inamdar said. “A scientific investigation can be conducted only by road experts who could be hired by the traffic police. The report could be discussed by traffic police with the civic bodies for necessary corrective action,” Inamdar said.